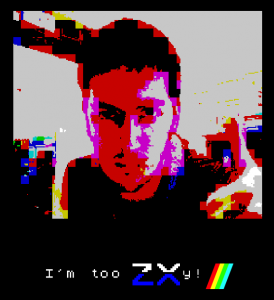 I’m Too ZXy is a webcam filter that renders you in real time in glorious ZX Spectrum Technicolor. It requires the Unity Web Player plugin, and of course, requires a webcam too! The ZX Spectrum style, with its 256X192 resolution and 16 colours, two of which are identical, transcended the limitations of hardware and achieved a recognised visual identity of its own. With 16 colours, only 2 of which can be used in every 8X8 block of pixels, the creativity required to achieve results bore the foundation of impressionist computer graphics for the years following. Simply click the play button below to start the app. Please note, the Unity Web player doesn’t work on mobile devices.